This cartoon appeared in the Dunedin Punch on 23 September 1865. 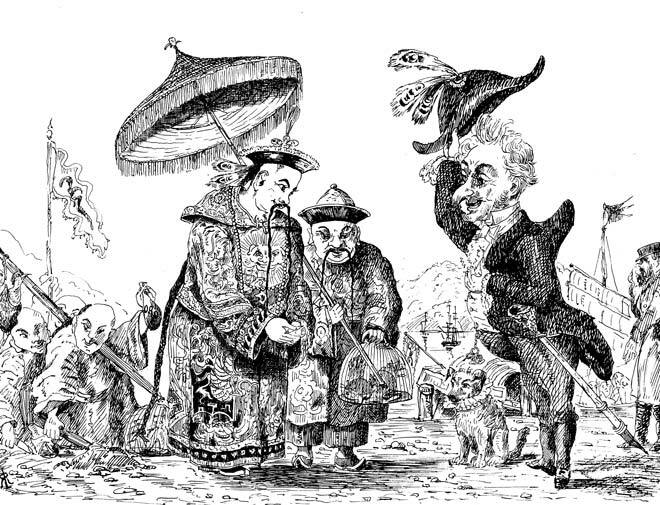 It lampoons the coming of the Chinese to Otago at the invitation of the Dunedin Chamber of Commerce, who were concerned at the loss of diggers from Otago’s goldfields to new discoveries on the West Coast. The Chinese came in the late 1860s as sojourners, hoping to find enough gold to get rich and return home. Some went back, but others died lonely old men. Yeah, my great-great uncle actually drew that, we have a copy in the book my auntie made of his cartoons.